It’s not just about hospitals anymore (and they’re changing too). Providers are reaching out. Above: At the Shirley Ryan AbilityLab, rooms are designed with patients’ unique needs in mind, with smart technology that facilitates comfort and accessibility. Image © Tom Harris. We all get sick. It could happen to a tech executive in Silicon Valley, who’ll take herself to Stanford Medical Center, give her car to the valet, and see one of the center’s top research-oriented clinicians. Or to a family of five living in the Washington, DC, neighborhood of Benning Heights that has a median yearly income of $34,739. Or to a nurse at Chicago’s Cook County Hospital, which is—not incidentally—where ER was filmed, and which boasts a stellar staff working in less-than-stellar facilities. With medical insurance back in play in the US, people are asking what it should cover. Is healthcare about caring for the very sick? Is it about rehab? Nutritional counseling? Genetic testing? Yoga classes? And there’s also the relentless pace of medical innovation and efforts to speed it up, like former Vice President Joe Biden’s cancer moonshot. Given this, how do healthcare providers and their design teams work with communities to ensure that their facilities stay technically and medically relevant? Tama Duffy Day uses the term “generative space” to describe the process that guides her team’s work. “It’s about aligning the physical space and the social space to shape healthy experiences and outcomes,” she says. Healthcare advocate Dr. Wayne Ruga coined the term when hospitals and academic medical centers carried the load of inpatient treatment. Today, community-based delivery, often outpatient, is just as important. Michael Crawford, Chief of Staff at Unity Health Care, Inc., is Gensler’s client for a brand-new structure for the Benning Heights community. He has seen a change in healthcare in the last few years, and attributes it to the Affordable Care Act’s required shift in emphasis from volume to outcomes. That has led to a revolution in how the care team organizes themselves around patient care. It means that when patients come in with a presenting problem, they’re treated for that, yes, but they’re also asked what kind of food they eat, what kind of exercise they get. They’re met by the energetic front-desk staff who’ve had the weight of daily paperwork taken off them by the medical records advancements that allow for seamless sharing of patient information. “Technology enables staff to be more efficient, which promotes better engagement with patients and colleagues. It also affords the clinicians and the care teams time to focus on providing patient care,” Crawford says. While there are airport-like kiosks, and much of the check-in process is automated, there’s still a human there to say hello, to help the person who can’t read or is too overwhelmed. Patient-centered healthcare is one thing to say and another to build. A central question for architects—and their healthcare clients—is how to translate patient needs for safety, compassion, and extremely good medicine into built space. There are so many competing needs. Patients require privacy, but sometimes want their whole family to come with them. Medical records are fiercely guarded by HIPAA, but being able to share institution to institution prevents information omissions that can lead to terrible outcomes. Patients who are treated for diabetes at great financial and physical costs could avoid that diagnosis entirely if they had access to nutritional information in their schools and communities—and access to fresh food at reasonable prices. Other communities struggle with addiction or mental health issues. It takes a holistic approach like Unity’s to engage patients grappling with complex medical conditions, and provide critical wraparound services like housing assistance, job coaching, and advice about diet and exercise. Nila R. Leiserowitz describes a cancer-focused facility she is working on with USC’s Dr. David Agus: “Even before you enter the building, it sends the message that you’re going to learn something from it, you’re going to receive care from people coming together to understand what they’re facing.” Just as children need soothing places that give them the sense that everything will be okay, adult cancer patients want clinics to have a gravitas that matches their experience of the disease. The facility also has the transparency to support precision medicine’s highly personalized and collaborative approach. Along with treatment, Agus encourages people to focus on long-term wellness by eating whole foods and moving daily to possibly prevent future cancers. “Our system is designed for care of disease, not for prevention or education. If we focus on those instead, it could be transformative,” he says. His holistic approach is similar to Crawford’s in Benning Heights. Agus encourages all of his patients to consider the consequences of their daily health decisions. He believes that making it clear what their choices mean for their long-term health helps people invest in personal wellness. The original Cook County Hospital. Image © Gensler/Michael Townsend. Cook County Health and Hospitals System’s new community-focused facility. Image © Gensler. Motivating people in the community to become actively involved in their own wellness is also the goal for Chicago’s Cook County Health and Hospitals System. Speaking of the old Cook County Hospital, Scott Hurst says, “You only went there if you had a problem. This was a place of last resort.” As one of America’s top trauma centers, Cook County Hospital gave George Clooney lots to do in ER. That kind of healthcare is for the desperate, but now there’s an additional challenge—expanding community accessibility. While supporting Cook County’s incredible doctors and its mission as a trauma hospital, the new facility aims to entice people to come in for regular checkups long before they need more serious—and expensive—interventions. BK Bartley, senior director of strategic planning at Johns Hopkins Health System, says that while academic centers build their reputations on their affiliated specialists, they want more of the community clinics’ “high touch” care. How to create that at a research institution that treats patients from across the country? “We know that virtual health and telemedicine will do nothing but grow,” he observes. To bring humanity into that growth requires careful consideration of previously unimaginable decisions—like how big to make the wall-mounted telepresence screen so that patients feel comfortable speaking with virtual caregivers. Bartley is also pushing beyond the tried and true. He cites waiting rooms as a major pain point. You can improve the waiting room, but could better scheduling eliminate it? What about private waiting spaces, so severely ill patients don’t cause one another stress? New health-related apps are released daily. One tracks REM cycles, another tracks heart rate variability, still others track symptoms related to weather or allergies. Ads encourage us to text photos of our rashes and moles to doctors willing to respond to e-mails or available for FaceTime consults. It seems like care is heading in a splintered and distracted direction, but the experts on the ground believe the opposite. They see healthcare—long fractured into “illness care,” “emergency care,” and leisure-oriented “wellness”—being braided together by thoughtful strategists and designers. 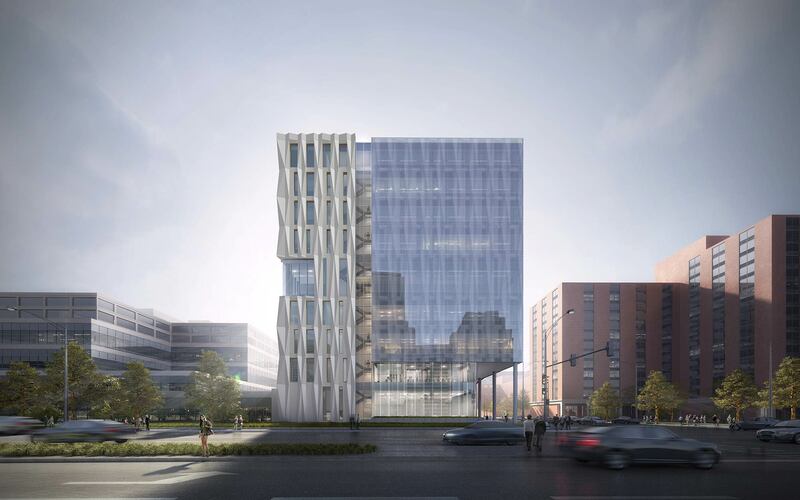 The 27-story Shirley Ryan AbilityLab celebrates new adjacencies in rehabilitative healthcare through its articulated façade. The project was designed as a collaboration between HDR and Gensler, in association with Clive Wilkinson Architects and EGG Office. Image © Daniel Schwalm. There’s a trend in urban healthcare facilities that requires better collaboration between patients and those who help them, says Leiserowitz. She points to the new Shirley Ryan AbilityLab in the heart of Chicago’s medical campus as an example. 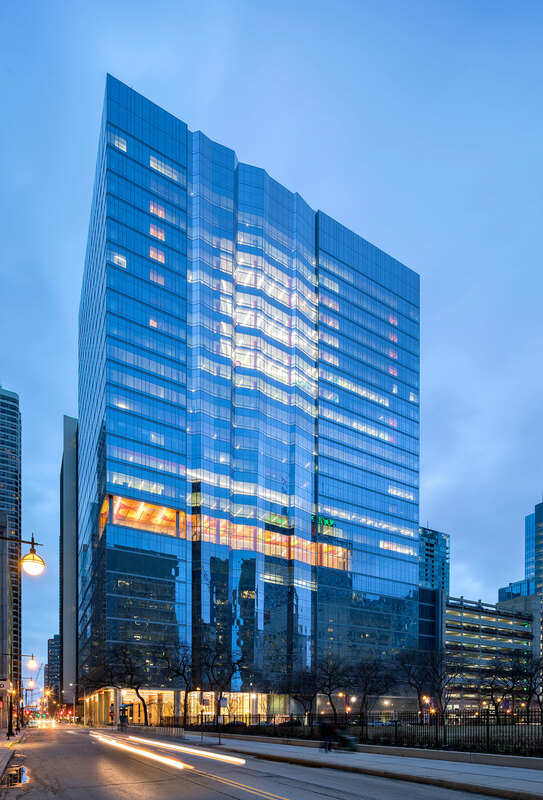 Formerly the Rehabilitation Institute of Chicago, the building is the first-ever “translational” research hospital in which clinicians, scientists, innovators, and technologists work together in the same space, surrounding patients, discovering new approaches, and applying—or translating—research in real time. This approach means patients have access to the brightest minds and latest research, and the best opportunity for recovery. And there’s the crux. As we all invest more in maximizing the brief time our bodies have on the planet, healthcare providers and their design teams are here to weave the threads together: how modes of treatment come together; how education and public policy emphasize wellness; and how buildings and settings organize human activity to deliver favorable outcomes. “Healthcare is about caring for human beings and helping them care for themselves. At its core, it is built on empathy—a communication method that makes the relationship between provider and patient stronger and more efficient, benefiting them both,” Day explains. Eva Hagberg Fisher is a writer and educator whose work has appeared in Guernica and Common Edge.